Until now, paleontologists have generally believed that the closest relatives of dinosaurs possibly looked a little smaller in size, walked on two legs and were carnivorous. However, a research team including Randall Irmis, curator of paleontology at the Utah Museum of Natural History and assistant professor in the Department of Geology and Geophysics at the University of Utah has made a recent discovery to dispel this hypothesis. The team announced the discovery of a proto-dinosaur (dinosaur-like animal) — a new species called Asilisaurus kongwe (a-SEE-lee-SOAR-us KONG-way), derived from asili (Swahili for ancestor or foundation), sauros (Greek for lizard), and kongwe (Swahili for ancient). The first bones of Asilisaurus were discovered in 2007, and it is the first proto-dinosaur recovered from the Triassic Period in Africa. Asilisaurus shares many characteristics with dinosaurs but falls just outside of the dinosaur family tree—living approximately 10 million years earlier than the oldest known dinosaurs. 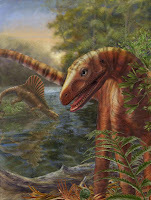 The description of the new species Asilisaurus kongwe appears in the March 4 issue of the journal Nature in a paper co-authored by an international team, including Irmis, Sterling Nesbitt, a postdoctoral researcher at the University of Texas at Austin's Jackson School of Geosciences, Christian A. Sidor (Burke Museum and University of Washington), Kenneth D. Angielczyk (The Field Museum, Chicago), Roger M.H. Smith (Iziko South African Museum, South Africa), and Linda A. Tsuji (Museum für Naturkunde and Humboldt-Universität zu Berlin, Germany). Fossil bones of at least 14 individuals were recovered from a single bone bed in southern Tanzania making it possible to reconstruct nearly the entire skeleton, except portions of the skull and hand. The individuals stood about 1.5 to 3 feet (0.5 to 1 meter) tall at the hips and were 3 to 10 feet (1 to 3 meters) long. They weighed about 22 to 66 pounds (10 to 30 kilograms), walked on four legs, and most likely ate plants or a combination of plants and meat. "The crazy thing about this new dinosaur discovery is that it is so very different from what we all were expecting, especially the fact that it is herbivorous and walked on four legs, said Irmis, who was involved in the researching the discovery over the past three years. Asilisaurus kongwe is part of a newly recognized group known as silesaurs. "We knew that there were a number of species from the Triassic that were similar to Asilisaurus," said Irmis, "but we were only able to recognize that they formed this group called silesaurs with the new anatomical information from Asilisaurus." Members of the silesaur group were distributed across the globe during the Triassic, when all of the continents were together in a supercontinent called Pangaea. Silesaurs are the closest relatives of dinosaurs, analogous to the close relationship of humans and chimps. Even though the oldest dinosaurs discovered so far are only 230 million years old, the presence of their closest relatives 10 million to 15 million years earlier implies that silesaurs and the dinosaur lineage had already diverged from a common ancestor by 245 million years ago. Silesaurs continued to live side by side with early dinosaurs throughout much of the Triassic Period (between about 250 million and 200 million years ago). The researchers conclude that other relatives of dinosaurs, such as pterosaurs (flying reptiles) and small forms called lagerpetids, might have also originated much earlier than previously thought. Silesaurs have triangular teeth and a lower jaw with a beak-like tip, suggesting that they were specialized for an omnivorous and/or herbivorous diet. These same traits evolved independently in at least two dinosaur lineages (ornithischians and sauropodomorphs). In all three cases, the features evolved in animals that were originally meat-eaters. Although difficult to prove, it's possible that this shift conferred an evolutionary advantage. The researchers conclude that the ability to shift diets may have lead to the evolutionary success of these groups. "The research suggests that at least three times in the evolution of dinosaurs and their closest relatives, meat-eating animals evolved into animals with diets that included plants," said Irmis. "These shifts all occurred in less than 10 million years, a relatively short time by geological standards, so we think that the lineage leading to silesaurs and dinosaurs might have had a greater flexibility in diet, and that this could be a reason for their success." This new species (Asilisaurus) is found along with a number of primitive crocodilian relatives in the same fossil beds in southern Tanzania. The presence of these animals together at the same time and place suggests that the diversification of the relatives of crocodilians and dinosaurs was rapid, and happened earlier than previously suggested. It sheds light on a group of animals that later came to dominate terrestrial ecosystems throughout the Mesozoic Era (250 million to 65 million years ago). "This new research suggests that there are more groups of animals yet to be discovered in this early period of dinosaur relatives," said Irmis. "It's very exciting because the more we learn about the Triassic Period, the more we learn about the origin of the dinosaurs and other groups."